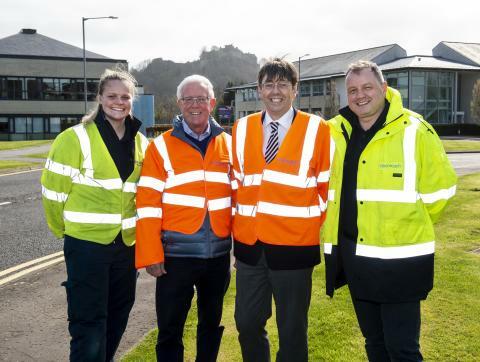 Stirling MSP Bruce Crawford today visited Openreach engineers working on an installation of the next generation of broadband technology for new homes on the city outskirts. He saw a ‘full-fibre’ network which has been built directly into the new homes near Raploch to deliver ultrafast internet connections. The future-proof services can carry speeds up to 1Gbps1 - 21 times faster than the UK’s current average. Mr Crawford also got an update on superfast services locally as he looked inside a fibre street cabinet2 at Castle Business Park. According to the independent website Think Broadband, nearly 90 per cent of premises in Stirling are now able to connect to broadband at a speed of 30Mbps and above. Mr Crawford said: “Good connectivity is a prerequisite in this day and age, so spending time with engineers to hear about the evolution of digital networks and what it means for people was useful. “The Scottish Government has been working with Openreach over the last several years to improve broadband, with nine out of 10 constituency households now able to get a superfast connection. The Digital Scotland Superfast Broadband partnership rollout has brought fibre-to-the-cabinet (FTTC) broadband to many local communities and includes small deployments of fibre-to-the-premises (FTTP) in areas where it is the best technical solution. “We’re glad Bruce Crawford was able to make time to come and learn about the challenges, technicalities and benefits of delivering digital technology in his constituency, and see an example of the next generation of broadband already live at Raploch. 1 These are wholesale speeds available from Openreach to all service providers; speeds offered by service providers may vary. FTTP is capable of delivering the fastest residential broadband speeds in the UK – up to 1Gbps – fast enough to download a two hour HD movie in 25 seconds or a 45-minute HD TV programme in just five seconds. 2Superfast services are delivered through a network of street cabinets while the latest ultrafast services are built directly to the home or business.